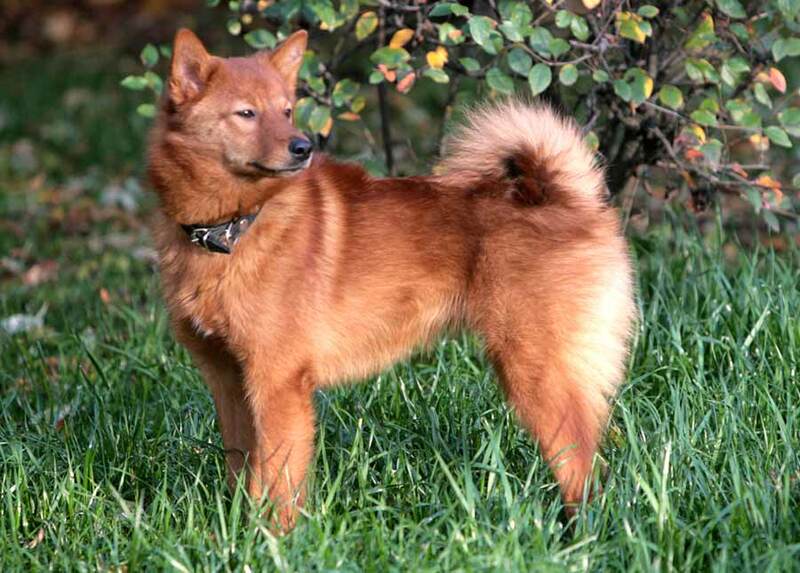 Finnish Spitz is the national dog of Finland. The Finnish Spitz is a barking bird dog who follows the birds until they are treed, and then she barks (with a ringing, yodel-like bark) to direct the hunter to her location. She is so valuable in her native land that a Finnish Spitz cannot finish her championship until she has proven her worth in the field. Competitions are also held to find the dog with the best bark. The Finnish Spitz stands between 15.5 and 20 inches tall and weighs between 25 and 40 pounds. She is foxlike, with a pointed muzzle, upright ears, and almond-shaped, dark eyes. Her tail is plumed and carried over her back. She has a dense, soft undercoat and a long, straight outer coat. Colors range from deep auburn to pale honey, but all are shades of golden-red. The coat will need brushing two or three times a week. The undercoat sheds heavily in the spring and fall and will need more brushing then. The Finnish Spitz is a moderately active breed that needs daily exercise. She will be satisfied with a couple of walks and a good run. All runs off leash should be in a fenced yard, however, as this hunting dog will take off if she flushes a bird or rabbit. Early socialization is very important to Finnish Spitz kept as pets, as these dogs can be wary of strangers. The barking can easily turn into problem behavior in an area where neighbors live close together. Early training can help control the barking, but these dogs will always bark. The Finnish Spitz is receptive to training but can be independent and just a little bit stubborn. She has a tendency to bond more closely with one person than with the entire family. She is usually quite tolerant of children and will simply walk away if the kids get too rough. She is good with other pets in the family when raised with them but can be aggressive toward strange dogs. There are no major health concerns. Share your Finnish Spitz story. Note: Upload only Finnish Spitz picture or your picture with Finnish Spitz below - spammer's ip may be blocked. He is very people-oriented and needs a great deal of companionship, especially from his favorite person. He doesn’t like being left alone,and because of his extremely sensitive nature, he doesn’t do well in an environment with frequent tension or loud voices.